Good evening, space fans! There was some drama (but thankfully a safe resolution) on the ISS this week, when an alarm roused the astronauts from sleep to indicate that an ammonia leak was possibly taking place. Fortunately, this was not the case. According to the New York Times, the alarm sounded not once but twice on Wednesday, when pressure had built up in a water coolant loop on the ISS. Normally, the water keeps the space station cool by circulating in the loops and then transferring the heat to external ammonia loops, which then radiate excess heat into space. Thusly cooled, the external ammonia loops keep the station chill from the outside, though due to ammonia's toxicity, it is not used to cool the station interior (hence the water loops.) The overburdened loop signified that perhaps ammonia was leaking into the water coolant loop, which would put it in dangerous proximity to the air inside the station. Even the smallest bits of space work need constant attention. NASA spokeman Bob Jacobs summed it up calmly, stating that, "We saw an increase in water loop pressure, then later saw a cabin-pressure increase that could be indicative of an ammonia leak in the worst-case scenario...So we protected for the worst-case scenario and isolated the crew in the Russian segment of the space station while the teams are evaluating the situation." Nonessential systems were temporarily shut down to prevent any kind of overheating on the station. This included scientific freezers aboard, but no data was lost due to the fact that the freezers are designed to remain cold for eight hours, independent of power supply. The power was restored well within the eight-hour window. According to the deliciously in-depth technical account of event posted on nasaspaceflight.com, after the initial high-pressure/possible leak alarm went off, the astronauts followed procedure by donning their PBAs (Portable Breathing Apparatus), cutting off the IMV (Inter-Module Ventilation), and quarantining themselves in the RS (Russian section) by sealing the Node 1 Aft CBM hatch. Atmospheric tests for ammonia were then conducted, all which fortunately proved negative. 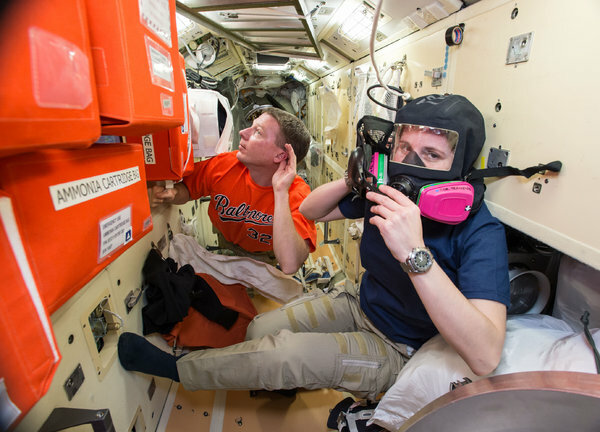 Ready for anything: NASA astronaut Terry Virts and ESA astronaut Samathan Cristoforetti practiced for problems on 12/1. Ground teams then rerouted the problem areas and vented nitrogen to relieve the pressure. The crew were cleared to reenter the US segment, but returned hours later when indications of rising cabin pressure once again manifested. Once again, no ammonia leak was detected. This second rise in pressure was likely due to the station rebooting itself after the power-down and use of emergency breathing devices. NASA Spaceflight considered the event a good practice run, albeit a somewhat scare one. They stated, "If nothing else, the incident served to exercise the well-practiced procedures, proving that both the crew and ground teams responded in a timely and appropriate manner to a situation that could have been very dangerous if missed – thus serving to prove the effectiveness of NASA’s vigorous regime of procedural training and simulation." All good in the orbital hood. The Russian space agency Roscosmos also agreed the scenario was handled well, with Maxim Matyushin, head of the Russian mission command center, telling the Independent UK that, "Safety of the crew has been achieved through the coordinated and timely actions themselves cosmonauts and astronauts, as well as operational management groups in Moscow and Houston." Despite the drama, fellow spaceman James Kelly (a Space Shuttle pilot who served two missions to the ISS) chimed in from mission control with some levity, enthusing, "Enjoy your impromptu day off." In other news, the SpaceX Dragon capsule that made it safely to the ISS last week caused no trouble...however the landing of its attendant Falcon 9 rocket was not so smooth. This week, exclusive imagery of the rocket crash was released. The original (and still tangible) intent from the SpaceX mission was to land the rocket safely on an offshore pad and have it retrofitted for re-use. This plan didn't exactly work out, just yet. Inappropriately exciting video (linked below) followed. Well, that's why they call it experimenting. Not bad, considering how few rockets, you know, LAND. That's all this week from our outstanding orbital outpost! Be sure to tune in next week for more awesomeness above the atmosphere...watch this space!